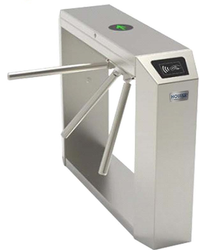 With the initiation of our vast industry experience, we are engaged in offering high-quality Tripod Turnstile gates. 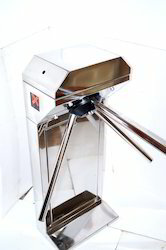 Our company is widely appreciated for providing Waist Height Uni-Directional Tripod Turnstile to the clients. Positive locking action for one passage at a time. Direction is shown clearly to users with LED indicators. We are instrumental in providing the customers with a wide range of Tripod Turnstiles. Widely used for imposing greater security and control at the entrances, the range is known for its attributes such as automatic access control, reliable performance, easy installation, wear & tear resistance and dimensional accuracy. - There are no exposed screws, it is safer for the user. - Smooth Operation designed for mass transit application. Twister Light, tripod turnstile, versatile and durable, suitable for all monitoring Requirements and selection of transits also in areas of high traffic flow.